Described by many locals as one of the prettiest, most desirable properties in town, this Old Town, 2 Bedroom, 2 Bath, 2 Story w/loft house is located on Soda Creek in Downtown Steamboat Springs, Colorado! This rustic, yet upgraded house/cabin includes all amenities, including W/D, Stainless appliances, granite countertops, bamboo and hardwood floors in the common areas, carpeting in the bedrooms, and linens and housewares for your convenience. In addition to the 2 beds, there is also a full size futon and a queen-sized blow-up mattress, if needed. A pack-n-play and baby gates are also available for those staying with small children. Home has 3 flat screen TV's, internet, cable and wireless printer. There is a new gas fireplace in the living room, and also a gas grill and outdoor furniture on the back patio overlooking Soda Creek. It doesn’t get any better than this downtown property! Feel like your in the north woods, right in historic downtown Steamboat with this private locate that is only a few blocks from all of Steamboats best shops and dining options! My wife and I purchased this property in March of 2018. We have owned the neighboring property for 13 years. I grew up in Laramie, Wyoming and moved to Steamboat when I was 16 to attend Steamboat Mountain School. I currently work for the City of Steamboat Springs Parks Department. My wife is from Wisconsin and moved here 15 years ago. She is a nurse at the hospital. We met here in town and feel very fortunate to be raising our family in the town we both love. We chose to purchase this property because we own the neighboring property and just love our little piece of nature in the center of downtown. The two properties are located in downtown and offer the convenience of being just a few short blocks from shops, restaurants and entertainment. The properties, however, are tucked in next to the creek and offer a serene and peaceful oasis in the middle of downtown. This house is located on the beautiful Soda Creek. The layout of the house offers incredible views up and down the creek. When you are in the house it feels as if you are the only house around and yet you are conveniently located in downtown Steamboat Springs. What a precious & private spot to cozy up & relax at! We are not skiers but love mountains & clean crisp air & we certainly got our share of it!! 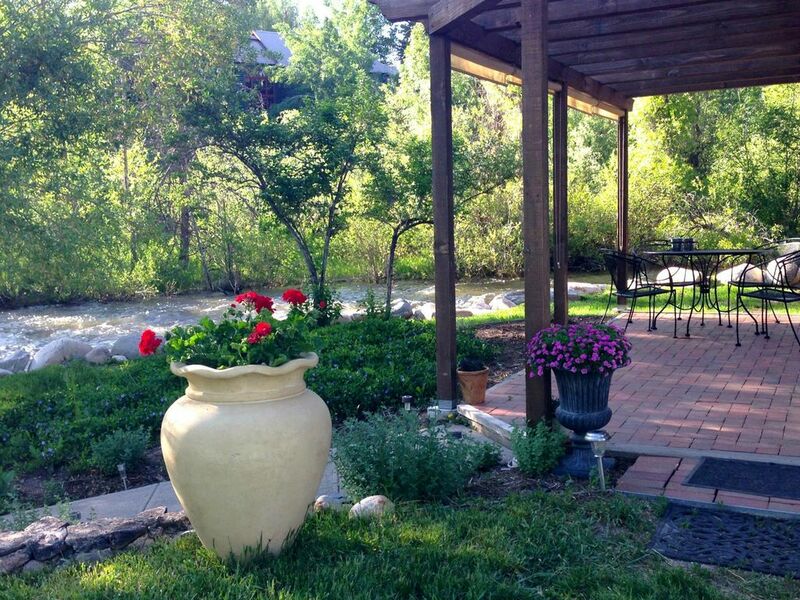 The cabin is charming, well stocked & perfectly situated by Soda Creek! The televisions in the living room & upstairs bedroom did not function correctly but that was not a deal breaker by any means!! Really looking forward to returning possibly in the Summer when our temperatures in Texas are scorching!! Thanks Robbie! One of the best rentals in Steamboat! Right up next to Soda creek in beautiful downtown. We will be returning!! We stayed just a couple days, but found ourselves wishing we'd planned to stay longer. This cabin is light and bright and cozy at the same time. We came at just the start of mud season, so we weren't sure how much fun the outdoor space would be, but the owners keep the yard fairly clear of snow, so we were able to enjoy the patio and the edge of the creek. The location is simple to get to, and it's just a short walk to shops and restaurants. We plan to stay here again! Great location - short walk to shops and restaurants, yet feel tucked away in a peaceful location! Two story precious cabin with a great kitchen. The upstairs is a landing at the top of the stairs with a futon, a bathroom with a shower, and the master bedroom. The downstairs is a living room, kitchen, bathroom with bath tub, and bedroom. There’s a river in the backyard and while we were there it was a winter oasis in town.